You may have read our recent Science 101 posts in which we explained the basics of nuclear fuel and what happens when it is taken out of the reactor. We mentioned storing it in a pool, something every reactor in this country does immediately after removing the fuel. Today we want to talk about the option of storing spent nuclear fuel in dry casks. Pools can only hold so much spent fuel. As they began filling up, utilities started looking for other ways to manage their fuel. A handful of companies developed dry storage systems. The idea is that after the fuel spends some time cooling in the pool, it can be loaded into a cask that is sealed to keep the radioactive material inside and protected. At its most basic, a dry storage system is a cylinder that is lowered into the pool and filled with spent fuel. When full, the cylinder is raised and dried before it is sealed and placed outdoors. There are many varieties of spent fuel storage casks. 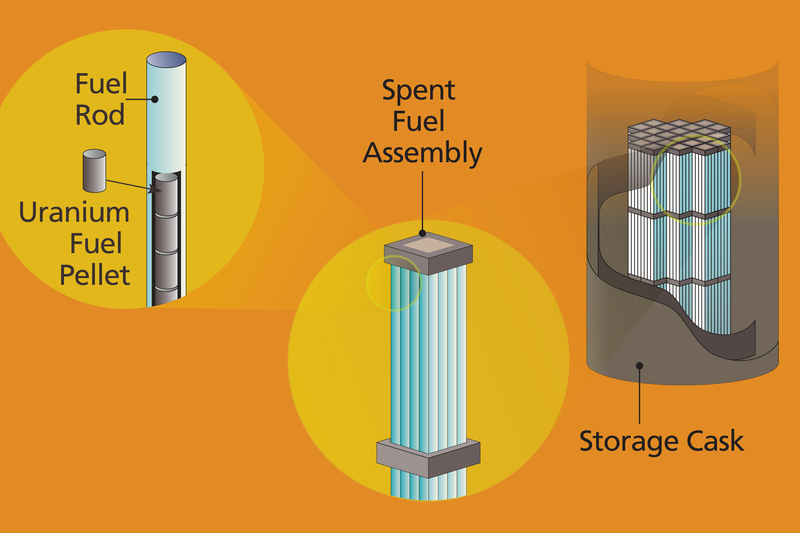 All storage casks need to manage the spent fuel’s heat and contain its radioactivity, and to prevent nuclear fission (the chain reaction that allows a reactor to produce heat). The casks must resist earthquakes, tornadoes, floods, temperature extremes and other scenarios. Casks come in different sizes. They are tall enough to hold spent fuel, which can be 14 feet long, and they can weigh up to 150 tons—as much as 50 midsize cars. In fact, plants may need a special crane that can handle heavy loads to be able to lift a loaded cask full of water out of their pool for drying. After the casks are dried and filled with helium, robotic equipment welds them closed to keep doses to workers as low as possible. Then the canisters are tested to ensure they are sealed. And once the dry, welded canister is placed inside thick shielding, the plants use a special transporter to move the cask outdoors to where it will be stored. At that point, the radioactivity from the cask must be less than 25 millirem per year at the site boundary. That means the highest dose to someone standing at the fence for a full year would be about what you would get going around the world in an airplane. The actual dose at the site boundary is typically much lower. As of December 2014, just over 2,000 casks have been loaded and are safely storing nearly 84,000 spent fuel assemblies. Cask designers must show their cask systems meet our regulatory requirements. The NRC staff reviews their applications in detail. We only issue an approval to systems that we know can perform safely. Most dry storage systems in use today have the spent fuel placed into an inner metal canister that is welded shut, then placed into a large metal or metal-and-concrete cask. The canisters are designed so they can be removed and put into transportation casks for eventual shipment offsite. Some casks store the fuel horizontally, the others vertically. The NRC inspects the design, manufacturing and use of dry casks. These inspections ensure licensees and vendors are following safety and security requirements and meeting the terms of their licenses and quality assurance programs. NRC inspectors also observe practice runs before utilities begin moving their spent fuel into dry casks. There are strict security requirements in place to protect the stored fuel. Security has multiple layers, including the ability to detect and respond to an intrusion. There have been no known or suspected attempts to sabotage cask storage facilities. Since the first casks were loaded in 1986, dry storage has released no radiation that affected the public or contaminated the environment. Tests on spent fuel and cask components after years in dry storage confirm that the systems are providing safe storage. The NRC also analyzed the risks from loading and storing spent fuel in dry casks. That study found the potential health risks are very, very small. To ensure continued safe dry storage of spent fuel, the NRC is further studying how the fuel and storage systems perform over time. The NRC is also staying on top of related research planned by the Department of Energy and nuclear industry. We’ll talk about “high burnup spent fuel,” which is receiving a lot of attention at shutdown reactor sites, in an upcoming blog post. Thanks for the response. The storage overpack obviously cuts down drastically on the maximum dose rate. But what is the contact dose rate on the surface of a freshly-loaded canister before the overpack is placed? And therefore the reason it has to be handled with remote equipment. Would you provide a link to the technical and heath studies and reports you are referencing? Also, it’s not just a lethal dose that is of concern. There are many health conditions that can be caused by this radiation. Also, does your estimate assume fuel cladding is intact? Does it assume the thin steel canister is not cracking? 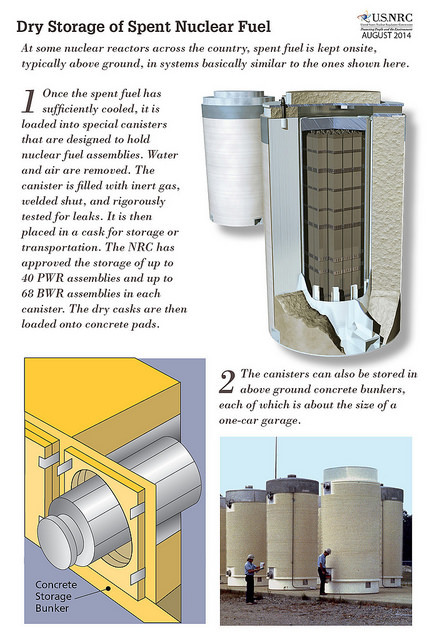 During loading and storage, the canisters in dry spent fuel storage systems are always shielded. A person would not stand directly next to a freshly-loaded canister without the shielding in place. Maximum doses on the surface of a freshly-loaded dry storage system (with the canister placed inside the storage overpack) can range from a few millirem per hour (comparable to what you would receive flying in an airplane on a coast-to-coast flight) to a few rem per hour (comparable to an X-ray computed tomography, or CT, scan), depending on the type of spent fuel loaded and the specific cask design. At those maximum dose rates, the hypothetical scenario of standing next to a loaded cask 24 hours a day and 7 days a week for an entire month would not expose a person to enough radiation to be lethal. Michele- please explain to the public what surface area percentage of the steel canisters in use and encased in concrete are being inspected presently? Also please tell the public how many canisters at each site is being inspected and how often? Then explain to the public how and why if these systems are being inspected in use today The NRC gave the vendors 5 years to come up with a method to inspect the steel canisters? Again, the NRC is more than a little short on the details. Or more precisely let George the Brit or Pierre the Frenchman do it. Even Japan (You know the country that was knitting with only one needle when they made that cowardly attack on Pearl Harbor) has taken action to do the right thing with High Level Waste (HLW). They have England and France take care of it for them. Yes Japan has taken the lead in doing the responsible thing with HLW. But it is not unusual; in fact it seems to be the rule, that other countries are taking the lead on most things anymore, anyway. For years Japan has been sending its nuclear plant spent fuel to both England and France. Long ago Japan entered into contracts with these countries to not only take their high level wastes but to reprocess them as well. Since only about 3% of spent fuel contains the fission products (the real nasty highly radioactive stuff), when the spent fuel is reprocessed only a very small amount of the hot stuff remains and has to be placed in storage. Japan has an interim (30-50 year) storage facility to take this so-called vitrified waste (waste that is safely sealed in a glass-like compound) as it is sent back from France and England. Therefore in Japan spent fuel does not sit around its nuclear plants and in the backyards of its citizens. Even with the fears of some in this country about reprocessing, we can at least let other countries carry the water for us like we let them do in so many areas anymore. And perhaps we can even pay those countries a little more to keep all this sh…stuff! In fact I doubt we would have to pay them anything for completely taking care of all our HLW. Provided we let them keep all the good unused fuel that is recovered. This so-called mixed-oxide fuel has been powering nuclear power plants in England and France for years. When pigs fly and a central permanent repository for this HLW (High Level Waste) is finally constructed in the US, is the waste stored at 93 nuclear sites in the US in a form to be readily transported directly to this repository without the risk associated with further handling and radiation exposure? Why hasn’t the US at least provided a central interim storage facility like the one that has been utilized in Sweden for some time? The Swedes did not tolerate having this dangerous HLW stored in their backyards all around their country. Even Japan has a centralized interim (30-50 year) storage facility. In your blog article you mentioned the low-level radiation limit that cannot be exceeded at the “site boundary” from HLW storage containers (25 millirem/year). The site boundary is a significant distance from the nuclear power plant itself, even a considerable distance from the secured protected area of the plant. As radiation dose drops off as the square of the distance, what is the radiation dose on the surface of these canisters when they are first off-loaded from the overloaded spent fuel pools at these plants? You mention that robotics must be used to protect plant personnel from this radiation, but fail to mention just how high the radiation field is directly on the surface of one of these freshly loaded canisters. Perhaps you could also put that radiation dose rate into a layman’s perspective by telling us just how long it would take for a person next to a freshly-loaded canister to receive a lethal dose of radiation. Would it be a few minutes or an hour or so? donna Gilmore spoke to the NRC author of this post just a day before she did this post and a day before I sent an email to the NRC Chairman and other key people about these issues. I’m guessing she did this post in response to that communication. My comments are waiting moderation. Donna Gilmore March 12, 2015 at 10:56 pm Your comment is awaiting moderation. NRC 8/5/2014 stress corrosion cracking meeting summary states: “Based on estimated crack growth rates as a function of temperature and assuming the conditions necessary for stress corrosion cracking continue to be present, the shortest time that a crack could propagate and go through-wall was determined to be 16 years after crack initiation.” This meeting summary also mentions the NRC is giving the nuclear industry 5 years develop the capability to inspect the thin (1/2″ to 5/8″ stainless steel canister exterior for corrosion and cracks. And the NRC plans to allow up to a 75% crack in the thin canisters. However, has produced no seismic analysis to support this. A Diablo Canyon canister has all the conditions for cracking in a two-year old canister. No one knows if it has cracked yet, because inspection technology is inadequate to determine this. Thousands of U.S. thin canisters remain uninspected. Thin steel canister technology is immature, so it will be a few years before we can expect a through-wall crack. I hope we don’t need to wait for a through-wall crack before the NRC raises their dry storage standards to require a system that can be inspected, maintained, and not susceptible to cracking. And thin canisters do not have an early warning leak detection system BEFORE a radiation leak. Only thick bolted lid casks meet all these requirements. However, as long as the NRC allows inferior standards, it is unlikely utilities will buy anything better. Most other countries in the world use thick bolted-lid cask systems and add extra environmental protection by housing them in buildings. The devil is in the details. Learn more here. Interesting to see thatythology and misinformation is spewing forth from the NRC in such abundance. The author provides little if any substance in fact to back up her statements. In fact storage casks as presently designed will leak after 8-10 years with MO ability to on site address that issue. The public is being devolved outright by Polyanna. Well since the NRC approved the use of high burnup fuel some time ago, seems it has little to do with shutdown reactors.But points out the fact that the NRC allowed the nuclear industry to put the cart before the horse. Testing continues on high burnup spent fuel and the set of available data is growing. Cask designers use the results to redesign their casks for higher burnups and additional fuel types. As more data becomes available, the NRC expects to be able to certify more casks. Cask designers also need this data to demonstrate the long-term safety of their systems so they can continue storing spent fuel beyond the initial license term. As a Virginian, I am extremely concerned that the citizens in our state were not asked or informed over Dominion’s plan to make North Anna nuclear power station a test site for high burnup spent fuel. Locating the test site at the nuclear power station that was knowingly built on a fault line….the same station where both reactors 1 & 2 were knocked offline by the 5.8 earthquake in 2011. The earthquake that exceeded the plants design basis for ground motion and moved 25 or the 27 dry casks some up to 4 1/2 inches. Of course Dominion was granted an exemption. So in reality, you guys don’t know how this high burnup spent fuel will preform in the long term. The purpose of this research effort is to determine the effects of canister/cask vacuum drying and storage on radial hydride precipitation in high‐burnup (HBU) pressurized water reactor (PWR) cladding alloys during cooling for a range of peak drying‐storage temperatures, internal gas pressures, and hoop stresses. The HBU PWR cladding alloys have a wide range of hydrogen contents and varying hydride morphology after in‐reactor service. time than the Department of Energy has allowed. * Repackaging requirements, if any, are uncertain. All this proves is the nuclear industry and it’s regulating (term used loosely) agency have placed people and the environment in harms way and what makes it beyond criminal is both the NRC and the nuclear industry see no reason to stop making yet even more of this waste. NRC 8/5/2015 stress corrosion cracking meeting summary states: “Based on estimated crack growth rates as a function of temperature and assuming the conditions necessary for stress corrosion cracking continue to be present, the shortest time that a crack could propagate and go through-wall was determined to be 16 years after crack initiation.” This meeting summary also mentions the NRC is giving the nuclear industry 5 years develop the capability to inspect the thin (1/2″ to 5/8” stainless steel canister exterior for corrosion and cracks. And the NRC plans to allow up to a 75% crack in the thin canisters. However, has produced no seismic analysis to support this. Previous Previous post: Spreading the Sunshine!